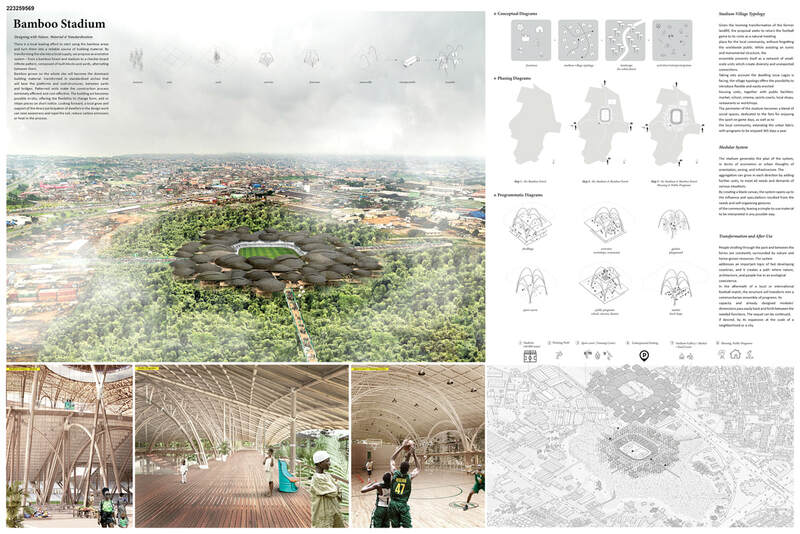 arch out loud challenged participants to design a new multi-purpose stadium at the former Olusosun Landfill in Lagos, Nigeria. How could this massive structure, known to be wasteful in its resources, limited lifespan, and inconsistent usage, confront critical issues of waste in Lagos while sited on a former landfill? 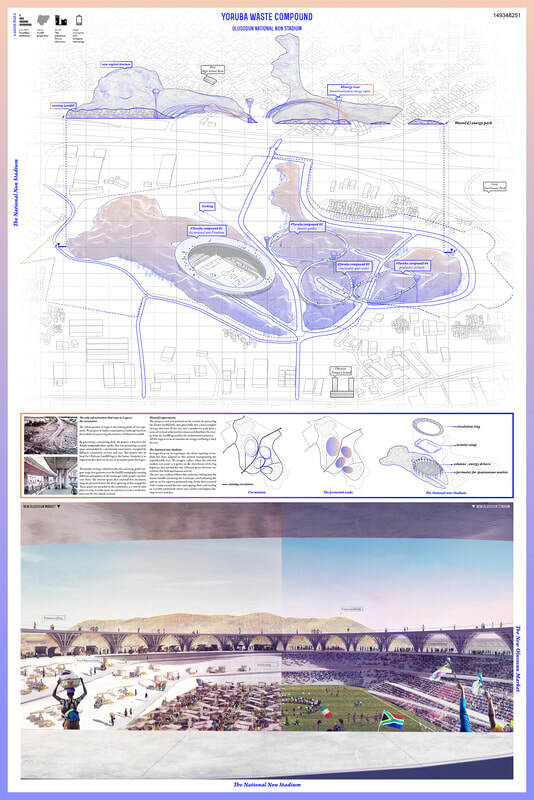 Designers were encouraged to consider how the stadium might act as a porous entity, serving as both a world-class sporting facility and local commodity. The stadium is the natural meeting place for the neighborhood: an evolutive, flexible and transformable infinite bamboo based-unit structure. The bamboo seeded on the site becomes the local building material. 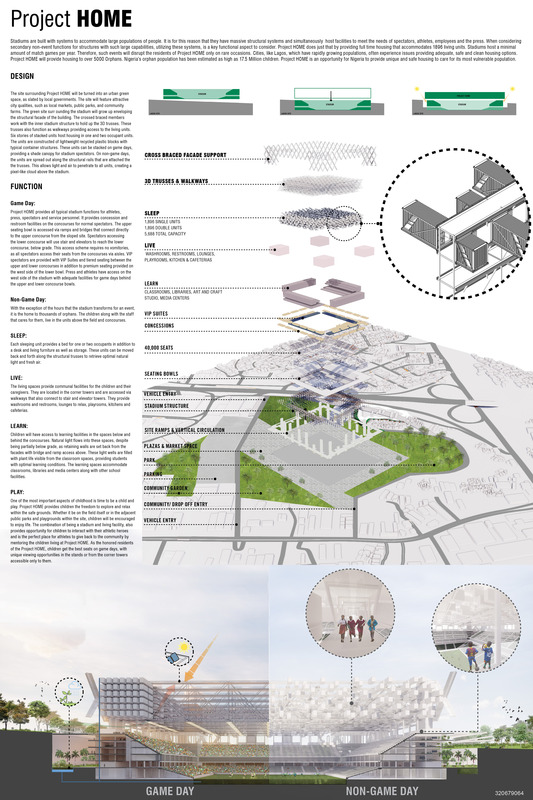 A mix of social spaces, dedicated to enjoying the sport on game days, as well as dwellings and local public programs, to be occupied all year by the local community, blend together in the small-scale system. The aggregation can grow in each direction to meet all needs of various situations, with a potential multiplication at the scale of the neighborhood or city. In Lagos, people live close to garbage dumps, which immerse the city in deeper problems of ecology and pollution, moreover Lagos is the largest importer of dangerous garbage. Recycle Cooperative Workshop - is a membership-based association of people created to achieve common economic and social goals that meet the needs of Lagos. The main idea of the project - garbage is a resource. It works as a hub for the production of items made of recycled waste. 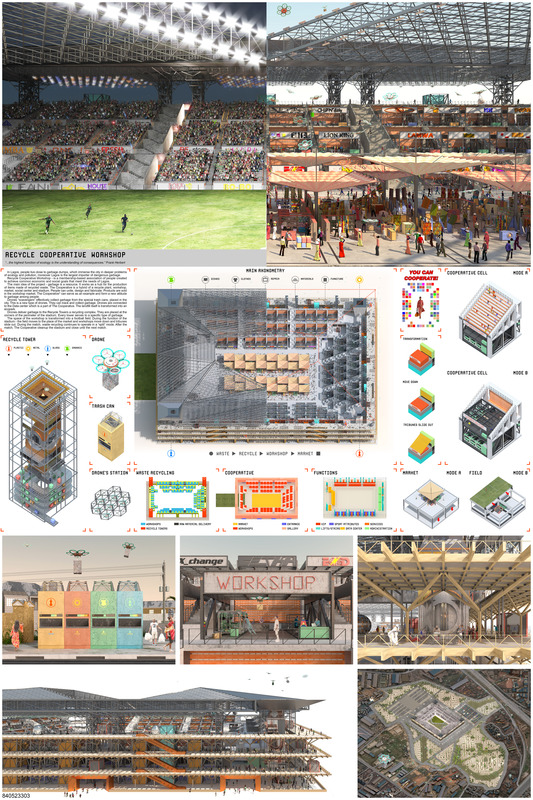 The Cooperative is a hybrid of a recycle plant, workshop, market, social center and stadium. People can unite, design and fabricate. Products are sold in the workshop market. The Cooperative can serve as an example and form a new attitude to garbage among people. A long-term proposal for Olusosun Landfill, including 3 stages. In the first stage, the mega structure of the "Platform" and Waste to Energy System (WtE system) is built onto the landfill, which enables the construction of the stadium and waste-to-energy process to be conducted at the same time. Waste resource could be reached under the "Platform" for generating energy and electricity for city of Lagos. In the second stage, stadium is built with movable structures on the "Platform" as an international football venue. 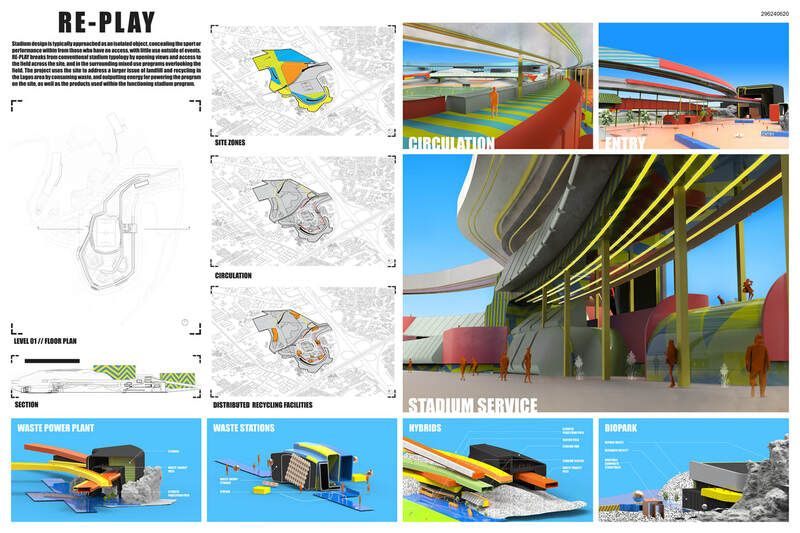 The stadium is meant to be light weight and economical, and allow sunlight to penetrate through. In the third stage, waste on Olusosun landfill is all consumed and the WtE plant is transformed to community center and other space according to needs. The urban paradox of Lagos is the starting point of our argument. The project is based on the Yoruba compound urban model; a central space protected by a perimetral circulation. In Lagos there are no typologies. The new non-stadium sinks into the former landfill enhancing the Landscape and facilitating the activity on the superior ring. Inside this excavated void, a ramp crossed the tiers unwrapping them and creating an accessible promenade where new activity happen. A place where informal markets can occur as it grows on the cloverleaves of the big highways. 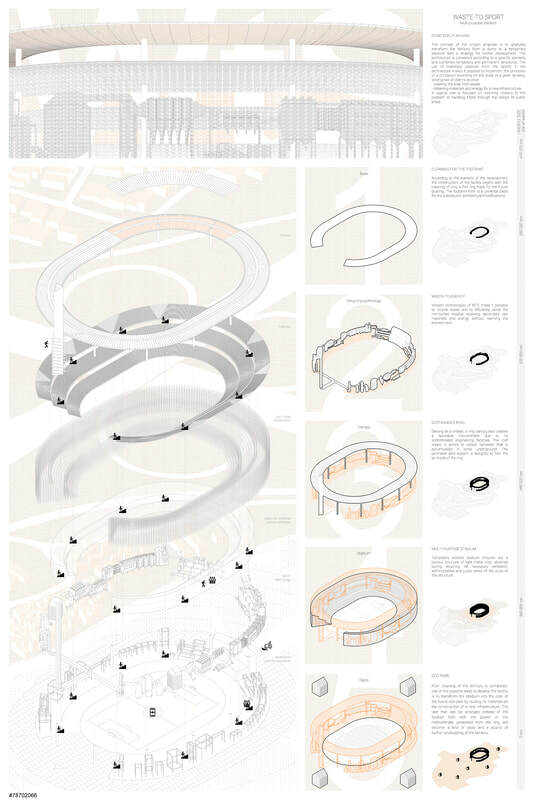 Informal spaces between circulation that held spontaneous activity. Square One seeks to turn the challenges of this site to a great potential for empowerment and sustainability - aiming for something that will live longer than the National stadium - hopefully even longer than the toxins in the landfill soil. 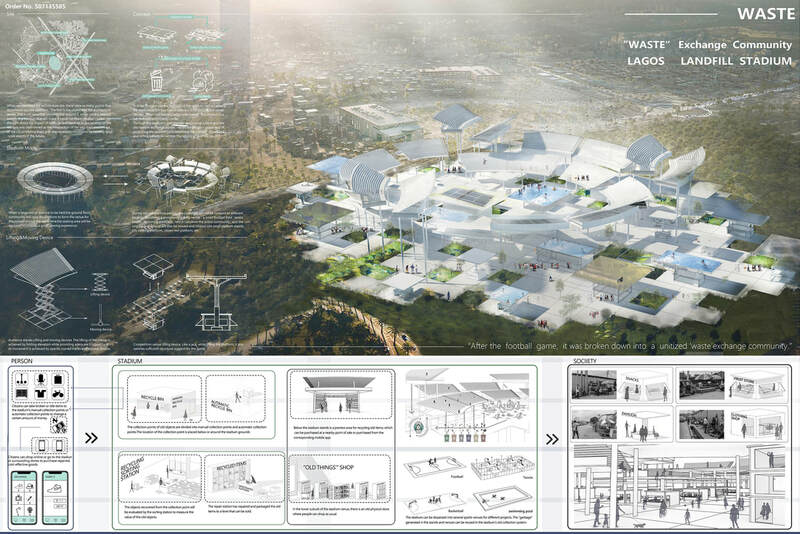 A simple shape together with the knowledge on how to revitalize wasted land, Square One has the potential to set an example and become a world-class arena for the people of Lagos. Let’s start from Square One! Materialism is at a tipping point. The material economy as we know it will soon administer its divorce from geometry, breaking the cultural constraints that are dependent on local and historically precise physical substances from sculpting form and lling volume. Instead, post-human matter - in the case of Lagos and many others, landll - will become the one and only dominant source of building material. is element brings with it new potential of object production, such as that of new-tech fabrication, that can activate the involvement of the community at large. The obstacle that Lagos is confronting is an infrastructure problem where all the conditions create a vicious circle that triggers in an inefficient way of laboring. The premise of this strategy is to take advantage of all the existing skills the scavengers of the landfill have and look for a way to improve them. As the natural resources will start to run out, the waste will be the answer to fabricating anything. 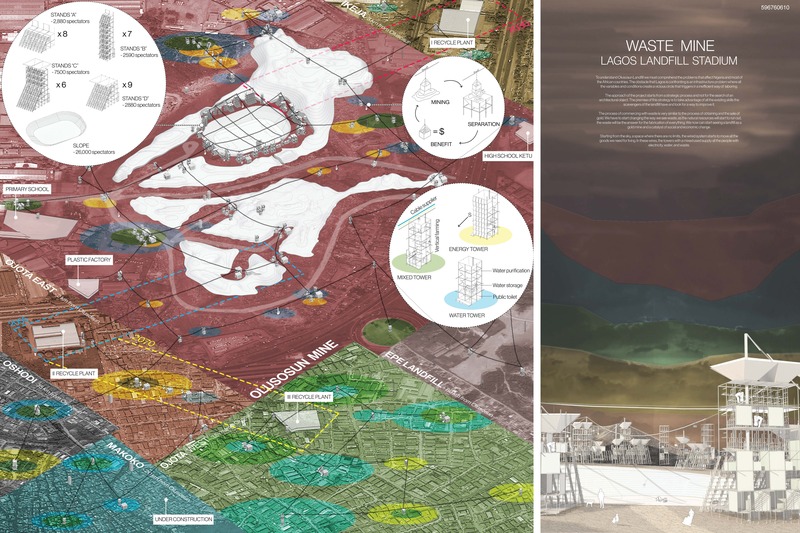 We can start seeing a landfill as a gold mine and a catalyst of social and economic change. After the football game, it was broken down into a unitized “waste” exchange community. To maximize the function of the stadium, we can adapt the stadium to the function of different time periods in a variable way . When not holding large-scale events , the stadium is a full-featured community center. 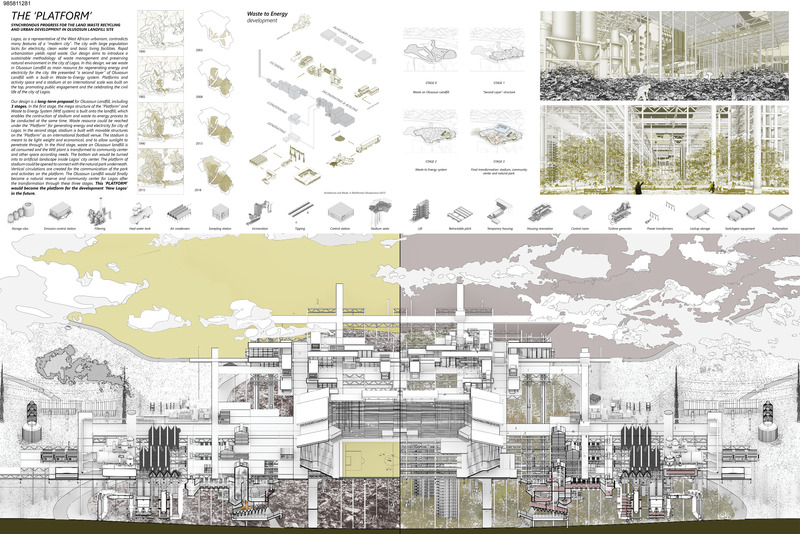 Through the stadium's garbage self-processing system and the old-fashion exchange model , we evoke people's awareness of protecting the environment, redefining the concept of garbage, and letting people remember the history of landfills. In the 1960s, the agricultural sector led the Nigerian's economy. Following the development of the oil market, Nigeria had become an exclusive importer of agricultural production, while the local industry wasn't able to provide the growing demand for food. The project suggests to turn the waste into a local resource, rehabilitate the ground, create new vacancies, revive the traditional agricultural sector and leverage the local economy. 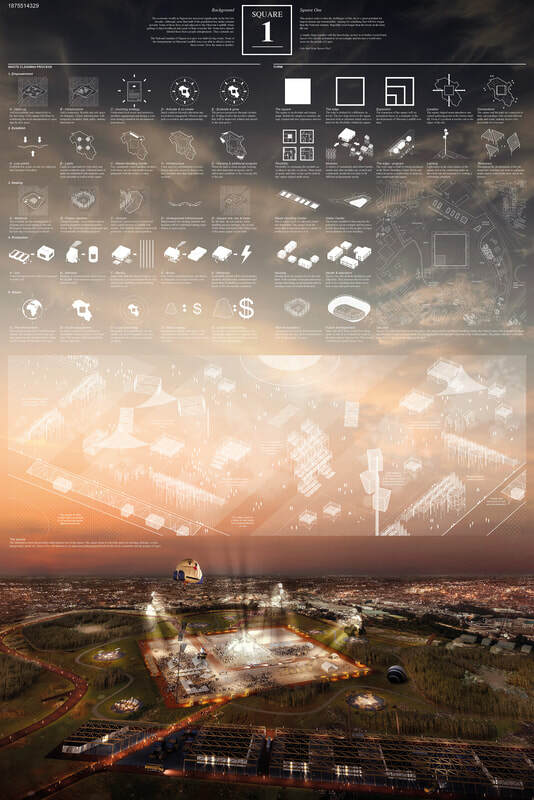 The stadium is used as an icon which integrated into this sustainable approach to raise the awareness about the new tendency, while the soccer-field will use as a multi-functional platform – routine and events. With the integration of the site’s unique history, materials and tradition, the way in which the project emerges from the trash can be encapsulated into 8 vivid phases where solar electricity, recycled materials, soil transformation, water/wind harvesting, and phytoremediation coalesce together to create alluring spaces with a myriad of purposes. 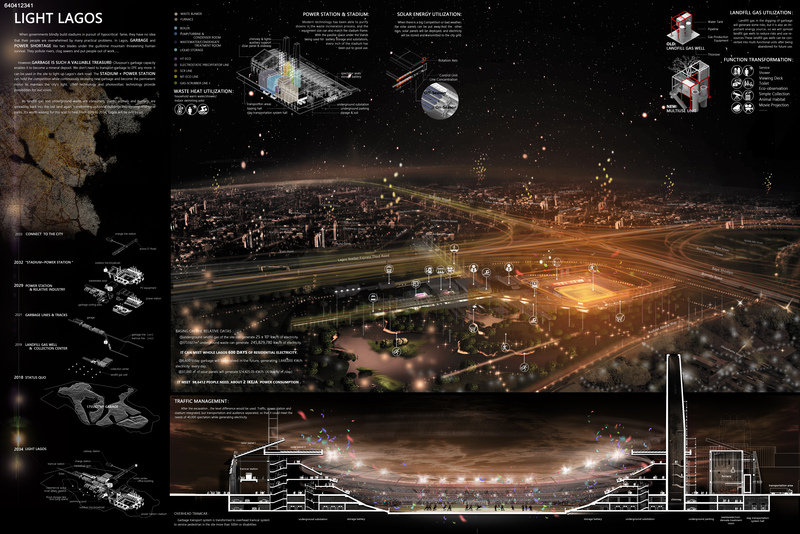 Upon unfolding the landfill through intricate manipulation of the trash’s topography, whilst giving careful consideration towards circulation networks and light quality the site evolves into an idiosyncratic amusement park, therefore activating it on a quotidian basis. These spaces create a cohesive entity that believes in learning from the past, transforming in the present and striving for greatness in the future. In Lagos, garbage and POWER SHORTAGE like two blades under the guillotine mountain threatening human survival. They pollute rivers, clog sewers and put people out of work…However,Garbage is a valuable treasure! Olusosun's garbage capacity enables it to become a mineral deposit. We use the garbage in the site to light up Lagos's road. Stadium + power station can hold the competition while receiving garbage and become the permanent motor to maintain the city's light. As landfill gas and underground waste are consumed, species are spreading back into the lost land again, transforming industrial buildings into thriving ecological parks. Rather than seeking to hide the waste by flattening it out, we shape it into an emblematic, dynamic hillscape that seeks to raise awareness of climate issues. The parcel has a natural pit topography. By clearing this area, the former landfill is turned into a landscape capable of draining and retaining water from neighboring areas during the frequent floodings. The waste is shaped into islands where the methane can be captured and transformed into carbon dioxide. The islands function as a sloping promenade leading through a leisure parc with sporting and cultural spaces, as well as unique viewpoints. The stadium is located at the highest point of the site, protected from flooding. It is the 9th hill of the park. Visitors can freely walk up to the top of the accessible roof, the highest point of the park to get an overview of the stadium, the city and recreation grounds. 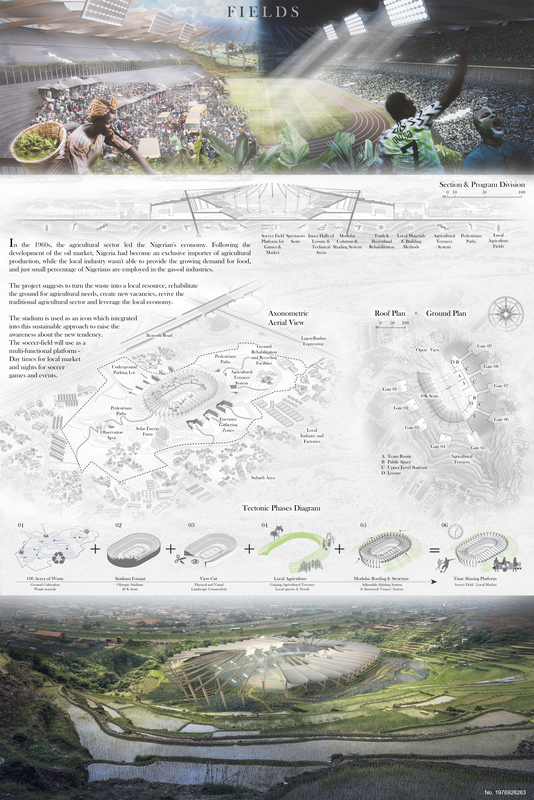 Parkadium is a phased project that looks to re-shape the existing Olusosun landfill into a park landscape for eastern Lagos. The new park is a landscape home to a multi-use stadium, tech-park and markets. It’s construction is simple and requires predominantly compact fill and topsoil. 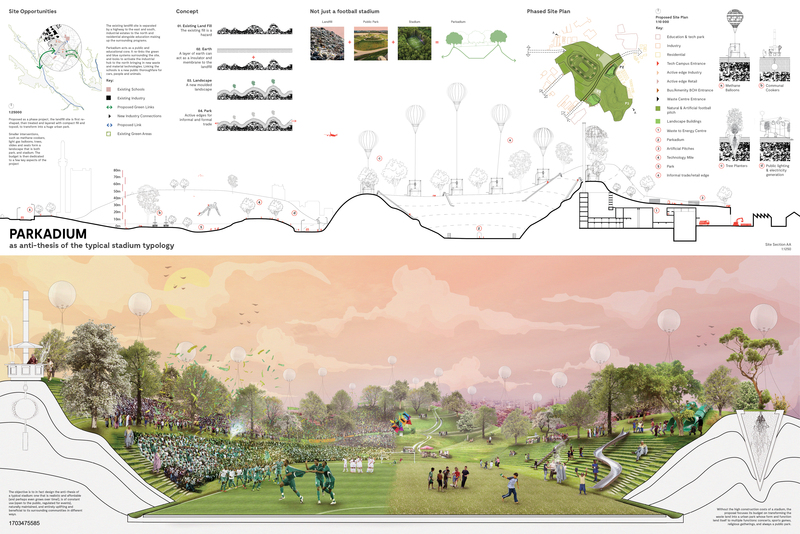 Parkadium is a new typology, marrying the visual requirements and broad form of a stadium with the benefits of a landscaped park. A hybrid of modern technologies (waste to energy, high-speed wireless internet, low-energy lighting) and incorporates elements from typologies such as stadiums and amphitheatres with the aim to be accessible to all. When considering secondary non-event functions for a stadium, utilizing the in place large building systems, is a key functional aspect to consider. Project HOME does this and provides full time housing that accommodates 1896 living units. Cities, like Lagos, which have rapidly growing populations, often experience issues providing adequate, safe and clean housing options. Project HOME will provide housing to over 5000 Orphans. Nigeria's orphan population has been estimated as high as 17.5 Million children. Project HOME is an opportunity for Nigeria to provide unique and safe housing to care for its most vulnerable population. The informal social and entrepreneurial systems embedded in the Olusosun landfill would flourish if their material infrastructure were enabled and their existence supported. This project proposes nodal units dubbed hydrants that facilitates the inherent economic practices of Olusosun all the while remaining a flexible infrastructure for future development. These nodes are zonally split into three sections which are further split into two programmatic components in each zone. 1. Market/Distribution and Farm 2. Shipping and Energy Production 3. 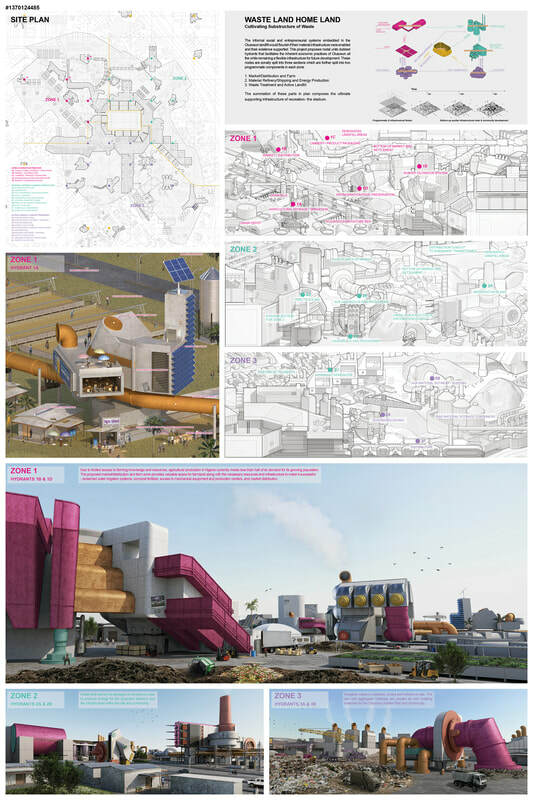 Material Refinery, Waste Treatment, and Active Landfill. 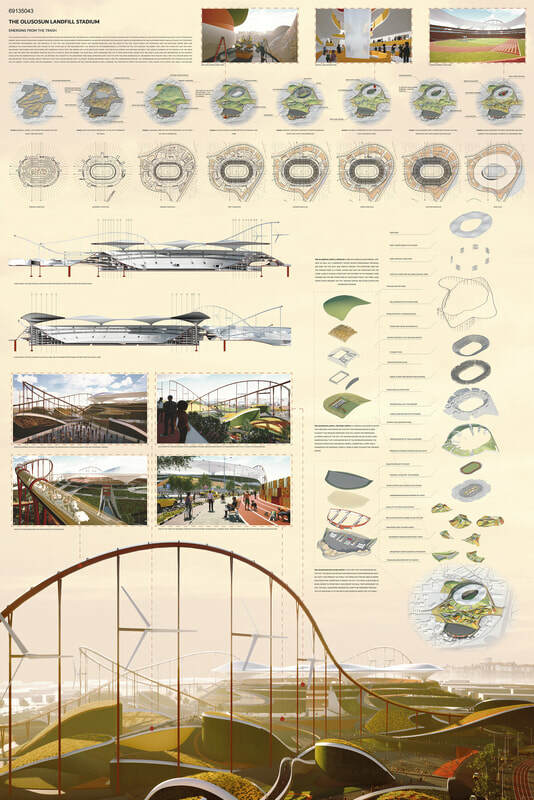 The summation of these parts in plan composes the ultimate supporting infrastructure of recreation- the stadium. Stadium design is typically approached as an isolated object, concealing the sport or performance within from those who have no access, with little use outside of events. 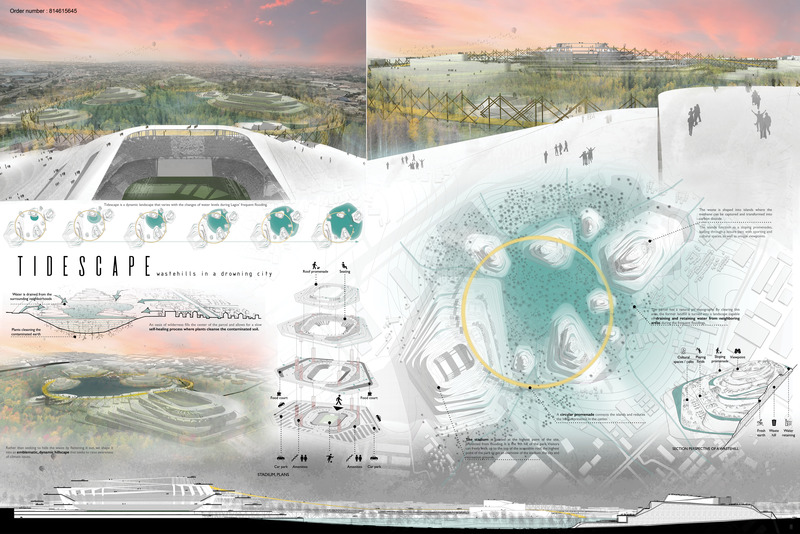 RE-PLAY breaks from conventional stadium typology by opening views and access to the field across the site, and in the surrounding mixed use programs overlooking the field. 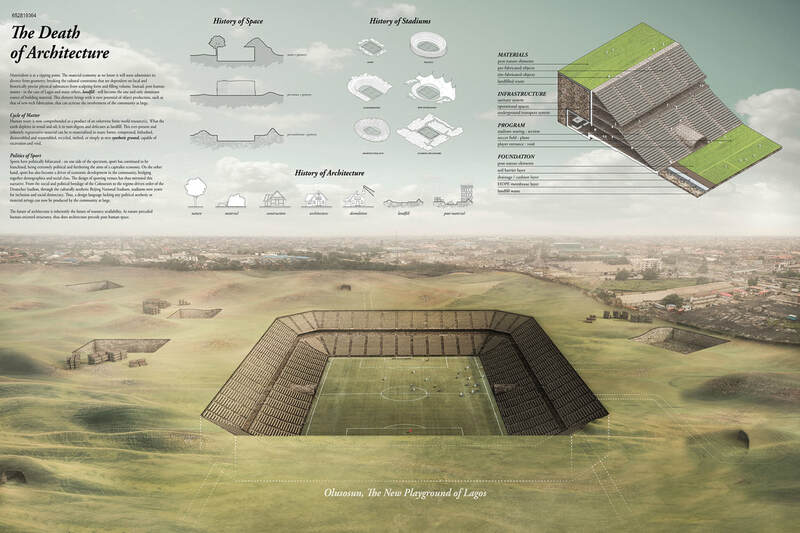 The project uses the site to address a larger issue of landfill and recycling in the Lagos area by consuming waste, and outputting energy for powering the program on the site, as well as the products used within the functioning stadium program. Olusosun Plasma contains the landfill utilizing a plinth superstructure embedded with plasma gasification refineries to treat waste. 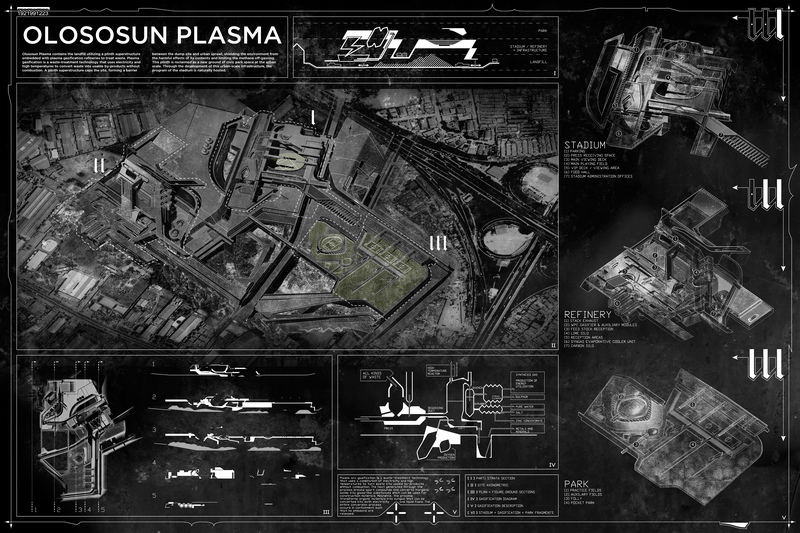 Plasma gasification is a waste-treatment technology that uses electricity and high temperatures to convert waste into usable by-products without combustion. A plinth superstructure caps the site, forming a barrier between the dump site and urban sprawl, shielding the environment from the harmful effects of its contents and limiting the methane off-gassing.This plinth is reclaimed as a new ground of civic park space at the urban scale. Through the development of this urban-scale infrastructure, the program of the stadium is naturally hosted.